The above quote is from The Hobbit, and part of the description of Smaug's treasure. 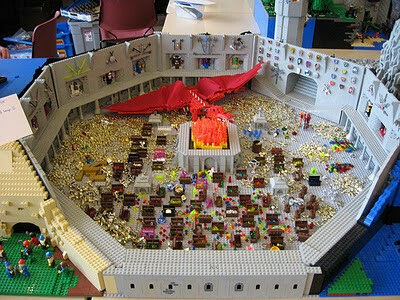 Here are two pictures of a Lego diorama I found online. 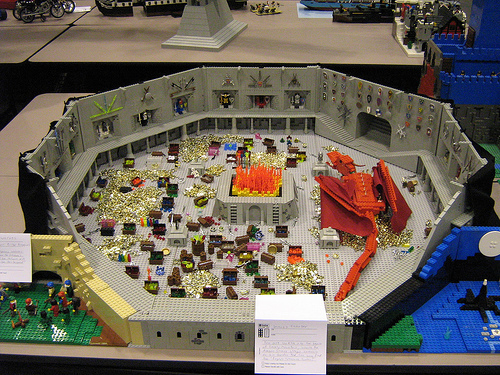 It's called Smaug's Chamber and its by a fellow named Richard. Grand crown of a dead king. Magical staff, weapon, or armor. When a party of lowly heroes slay a dragon and take the treasure hoard, they pretty much have it made. Seriously, why even try to total up that kind of wealth? buying a sword isnt ever going to be a problem again. Moreover that kind of money is enough to create more wealth if invested in the construction of a Keep, cuz then the heroes can start collecting taxes. I would certainly not go though the process of figuring out an exact gp figure for the hoard, I'd just tell the players "you each have a pile of treasure about as big as a house". At this point you can stop tracking gp scale wealth for the PCs, since they should be name lvl now that they own a treasure hoard and they should build their own strongholds. I will get to my complete thoughts on strongholds in a later post. PCs now will have a treasure hoard supplemented by further income, so at this point PC wealth is measured in terms of special and magical items. The problem with having a treasure hoard though, is that everyone will want it: every thief and adventurer in the land, the brother of the Wyrm you just killed, even the exiled king the dragon stole the hoard from in the first place. The party will soon learn that slaying the dragon will have been the least of their worries.